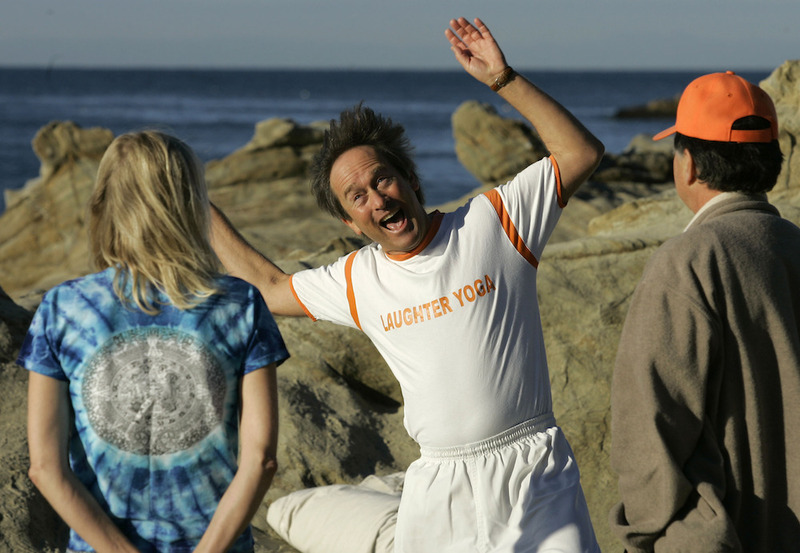 Practitioners of laughter yoga meet up for a class in Laguna Beach, California. Photo by Chris Carlson/Associated Press. There’s nothing particularly funny about a laughing club, except the premise. I first heard of laughing clubs when they appeared on the American radar about a decade ago. I might not have paid attention if it wasn’t for the fact that laughing clubs are supposedly Indian, started by a doctor named Madan Kataria, also known as the “Guru of Giggling.” I was editing a California-based Indian-American magazine at the time; it was my job to think critically about the representation of India and Indians in the United States. “On the sunny shores of Laguna Beach, Calif., a group of otherwise sane adults gather every morning to laugh hysterically,” a typical article began. “They sound like the seagulls hovering nearby, or kooky lunatics…sticking their tongues out like goofy lions.” Were these clubs really “Indian,” I wondered? Or an alternative Californian practice, with tenuous roots in the East? Practitioners of laughter yoga, or “hasya yoga,” claim that voluntary laughing has numerous salutary effects. It cleanses the blood, prevents illness, relieves stress, frees us from the fear of death, makes us happy, youthful, and more productive, advances world peace, and unifies humanity. “Motion creates emotion,” the laughing club mantra goes. “Even forced laughter soon becomes real,” laughter guru Sebastien Gendry teaches. If you act happy, you will become happy. If you laugh first, humor will follow. Laughter yoga is apparently practiced in boardrooms, universities, gyms, senior centers, prisons, and cancer wards across the United States. In San Francisco, a Chinese women’s club practices “laughter tai chi.” There’s laughter yoga as therapy for war veterans. There’s even “Laughter Yoga on the Phone.” Kataria’s methods have been endorsed by American doctors and wellness experts like Sanjay Gupta, Andrew Weil, and Oprah Winfrey. In 2009, speaking before the Senate Committee on Health, Education, and Labor, Weil offered laughter yoga as a way to lower health care costs. But is it Indian? Around the world, laughter yoga has been embraced as an artifact of Indian spirituality, but the reality is more complex: Laughing clubs are a network of international businesses that, like “the yoga-industrial complex” more generally, brandish their supposedly Indian origins as a badge of authenticity, tradition, and beneficence. Google “laughing club” and you’ll find scores of laughter teachers (“innerpreneurs”) around the world: among them, Kataria, Ramesh Pandey of “America’s Got Talent” fame, Ohio-based psychologist Steve Wilson, who runs the World Laughter Tour, and Gendry, self-named “Laughterpreneur” and founder of Laughter Online University. By one count, there are laughing clubs in 72 countries; by Gendry’s, 82. Laughter is a universal human behavior, so it makes sense that Kataria’s appeal in particular, like that of Art of Living’s Sri Sri Ravi Shankar, who teaches specialized breathing, and Mata Amritanandamayi, known as “the hugging saint,” is international. In 2010, “millions of people” reportedly tuned in to watch Kataria laugh alongside Goldie Hawn at a Sony Pictures Studio set. Although the event took place in Los Angeles, Kataria offered his “warm special greeting from India,” as if, to extend the argument of Edward Said’s Orientalism, he was not only “first an Oriental and only second a man,” but actually India itself, and only then an individual. The irony is that laughter is not necessarily held in special esteem in India. Kataria himself claims the opposite. “We’re told not to laugh in front of elders,” Kataria tells director Mira Nair, in her 2001 documentary, The Laughing Club of India. “Don’t laugh in temple; don’t laugh in church; don’t laugh in public place.” Other club members interviewed similarly describe a social injunction against laughing: “Ladies have a different laugh, because women hide something…they don’t open out and laugh fully”; “In Indian society there are many restrictions.” Here, laughter yoga emerges first as a corrective to repressive mores in some quarters of contemporary India. Only later does it become an Indian export to the world. Both in India and abroad, the appeal of laughter yoga is that it issues from elsewhere. In India, that elsewhere is the distant past. In the United States, that elsewhere is both another place and another time. It is “cutting edge 21st century science…written 3,000 years ago,” as one of Gendry’s marketing papers describes. These papers, which include color-coded flow charts and footnoted theoretical exegesis, tellingly mash up spiritual and scientific terms. Quotes from the Proverbs and descriptions of meditation appear alongside claims regarding laughter’s impact on serotonin release, cardiac vagal tone, and neuropeptides. In this, laughter yoga is not unlike some of the other “ancient secrets” that Americans have embraced as the path to health. For example, American food and beverage companies have recently discovered the anti-inflammatory and antiseptic properties of turmeric. It’s their newest “old world” discovery, like ancient grains and coconut water, which, to the amusement, and in some cases consternation (pineapple-flavored coconut water?) of Indian Americans like me, now retails alongside apple juice in the average grocery store. Like other diasporic Indians, I sometimes find it annoying that the turmeric latte, or “golden milk,” has become an international “superfood du jour.” The contours of this annoyance oscillate between feelings of nonrecognition (like having your good idea noticed belatedly), misrecognition (like having your name mispronounced), appropriation (like you’ve been plagiarized), and injustice (like you’ve overpaid), coupled with the grudging acknowledgement that I don’t own turmeric by virtue of my Indianness. In the case of both golden milk and yoga, what matters is that they are Indian and not, that they have both roots and routes. And with yoga, its ancient history matters. But its American history matters, too. Singh and Sukul were selling just what Americans wanted to buy: the wisdom of the other. They were able to profit off the American love of enterprise and “add on” spirituality by becoming entrepreneurs of the self. It is a story as old as they come, but with a twist. What has always made America great is its ability to embrace the outside world, to welcome in the different, and to assimilate knowledge from elsewhere into its body politic. On the flip side: Sometimes the wide-eyed Americans, like the 1920s Oklahomans eager to embrace the teachings of the mystic East, end up looking like patsies. But better patsies than pirates. Better curiosity and genuine interest than suspicion and mistrust. The double-edged history of yoga in America persists today in the ways that yoga is both widely practiced around the country and still seen by some as a threat to so-called American values. There are currently “yoga bans” in schools in states including California, Georgia, and Alabama, due to worries that yoga promotes “a non-Christian belief system” and “Eastern religions.” This contemporary example of American xenophobia puts the issue of yoga’s Indianness into sharper relief, and even though laughter yoga is not the specific target of these bans, it returns us to the questions with which I began. What is my relationship, as an Indian American, to the “kooky lunatics” laughing together on Laguna Beach? Do I have one? Well, no, I don’t. And yes, I do. The messy, worldly, absurd laughing club, with its promise of spiritual renewal and improved health, is a perfect emblem of the American immigrant’s impossible, beautiful dream. The dream that if I, immigrant to America, put on a brave, smiling face, breathe deeply, think positive thoughts, and channel my internal resources, I will be able to meet any structural or institutional obstacle this country sends my way. The dream that if I, child of immigrants, perform as an American, then one day I will be recognized as one. We all have choices to make when faced with unfamiliar practices and knowledge. Recoil in fear. Ignore as other. Reject outright. Or, we can embrace what there is to be learned without taking it over. Laughter yoga is practiced in the space between being and becoming, the space between who we are and who we wish to be. This, too, is a lesson of the laughing club: that there is always room for others to laugh among us, if only we would let them, if only we would liberate our fully human selves. Ragini Tharoor Srinivasan is assistant professor of English at the University of Arizona. She is also a journalist and former editor of India Currents magazine.